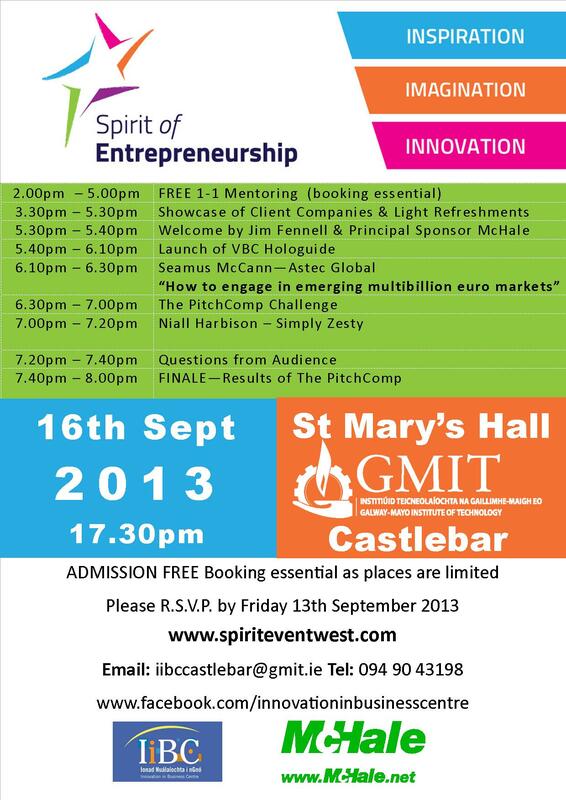 The annual ‘Spirit of Entrepreneurship’ Event taking place at 5.30pm on the 16th September 2013, at St. Mary’s Hall, Galway-Mayo Institute of Technology in Castlebar, Co. Mayo is set to inspire and motivate with this year’s line-up and attract in excess of 300 attendees. The interactive and dynamic annual Spirit of Entrepreneurship Event with the theme ‘Inspiration, Imagination, Innovation’ offers a very exciting programme line up for this year. The event regularly attracts anywhere between 300-400 attendees from all areas of business, including start-ups, investors, venture capitalists, established businesses and exporters. Over the years the event has been host to many familiar faces. In 2012, Terry Clune, founder of Taxback.com and Michael Dwyer, CEO of Pigsback.com attended and shared their experience of being an entrepreneur. Previous speakers also included Jerry Kennelly, Stockbyte & Tweak, Frank Salmon, CMS Peripherals, John Concannon, JFC Manufacturing, Tommy Griffith, PEL Recycling, Sean Rowland, Hibernia College, Leonard Moran, Ovagen and Biological Labs Ballina, Jonathan Ruane, Eventovate, Sean Gallagher, entrepreneur and former panellist on TV programme Dragon’s Den, and Ciaran Crean, co-founder of Micksgarage.ie. This annual event organised by the GMIT Innovation in Business Centres, will feature the success stories from two dynamic, high profile entrepreneurs. Niall Harbison of the Simply Zesty fame will speak about “How to achieve spectacular growth for your company”. Simply Zesty is the social media agency that was founded in 2009 with seed capital and was then sold just 3 years later to UTV plc for €2,000,000. Seamus McCann founder of Astec Global, one of Ireland’s most international consulting companies, will talk about “How to engage in emerging multibillion euro markets”. An exciting and revolutionary technology will also be unveiled exclusively at the event – the world's first virtual intelligent display called “Hologuide” will be launched by its creators IiBC client company Visual Brand Communication (www.vbc.ie). The event will also provide some interactive features, such as FREE business mentoring with experts from Enterprise Ireland and Mayo County Enterprise Board mentoring panel, an Interactive showcase of Client Companies of the GMIT Innovation in Business Centres (IiBC), and excellent networking opportunities, including opportunity to talk to local and national enterprise agencies. A live competition - The PitchComp - where three companies from the GMIT Innovation Centres will pitch their business ideas for 3 minutes (Dragon's Den Style) to the general public and a selected judging panel will also take place and the audience will be able to help decide the winning pitch. The Spirit of Entrepreneurship Event is organised as part of the Mayo Ideas Week which runs from 16th to 20th September 2013. More details about the event and on how to register can be found on www.spiriteventwest.com.